The Earth’s Critical Zone is the thin veneer at the surface of our planet where water, rocks, gases interact chemically. It is a medium resulting from the transformation of primary minerals by the oxygen and the CO2 from the air into something porous, clay and organic matter-rich. This zone is not only critical as it is one of the main planetary interfaces (a critical boundary layer), but also because this is where Life has evolved. This is our habitat. This is from this zone that we extract our food, our water. This is in the zone that we store our wastes. This zone is complex. Lying at the interface of deep earth and solar energies, the Critical Zone is made of different entities and its investigation is shared by many disciplines. These disciplines have specialized with time and have now some difficulty to communicate and share a common representation of the Critical Zone and its behavior. 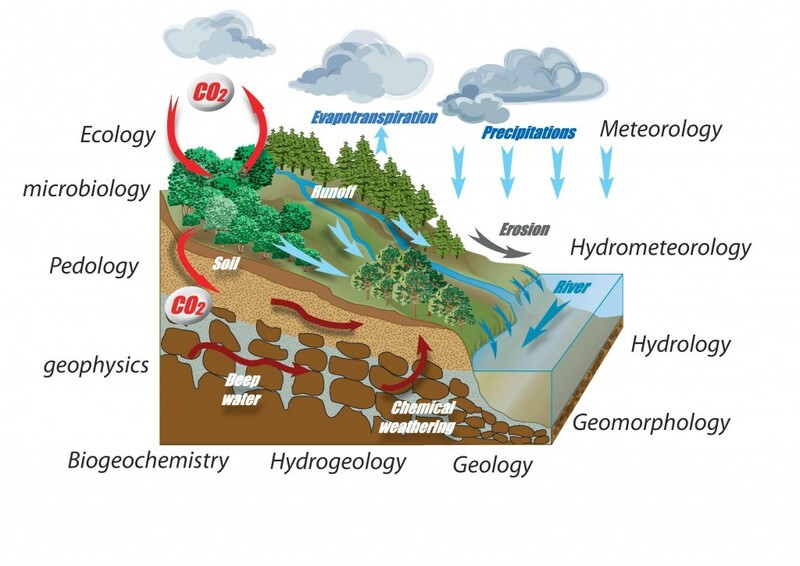 Disciplines are geology, geochemistry, biogeochemistry and geomicrobiology, geophysics, pedology, geomorphology, hydrology and hydrogeology, ecology. The fragmentation of scientific communities interested by the critical zone has precluded a holistic understanding of the Earth’s surface and its response to the current forcings it is submitted to. The concept of Critical Zone was proposed by the National Council for Reasearch in the US in 2001 to denote the skin of the Earth, the zone comprised “between the sky and the rocks” were life is and which is so critical to better understand for our future. Since then, Critical Zone science has became an international initiative aiming at developing Critical Zone observatories along global gradients. American, European, Australian, Chinese programs have recently been developed.